The image below are typical of the results of Green Tech Carpet and Tile Cleaning’s tools and methods. This recent job was done for a residential customer in Palm Harbor, Florida. We started the carpet cleaning process by first discussing with the customer any concerns that she might have with the cleaning process. She explained that her grand children played int the room and that she did not want any harmful chemicals used during the process. My wife, Terry explained that all of the products used in our hot water extraction process are green seal certified and completely safe for use in the home. Also, all of our products used in the steam cleaning process are Eco-friendly and that most of our customers in the Palm Harbor, FL area are also very concerned with the cleaners used. We began by first per-vacuuming the carpet to remove any dry soil that may have been present. We use a commercial grade vacuum cleaner that is able to remove dirt where the homeowner’s vacuum may have missed. Green Tech then addressed several spots that were present on the carpet. These spots are present in most Palm Harbor, Florida homes and we were able to completely remove the spots. As explained to the customer this is part of the service and spots can generally be completely removed. We as discussed stains, which sometimes can be reduced in appearance, but can not be completely removed. The next step in the steam carpet cleaning process was to apply the effective professional carpet cleaning pre-spray. This pre-spray is especially created for this method. It is extremely effective, but is also safe for use in the Palm Harbor, FL home. It is Eco-friendly and green. It also does not leave behind any dirt attracting residue. Green Tech Carpet and Tile Cleaning usually take the additional step of agitating the pre-spray directly into the carpet’s fibers. 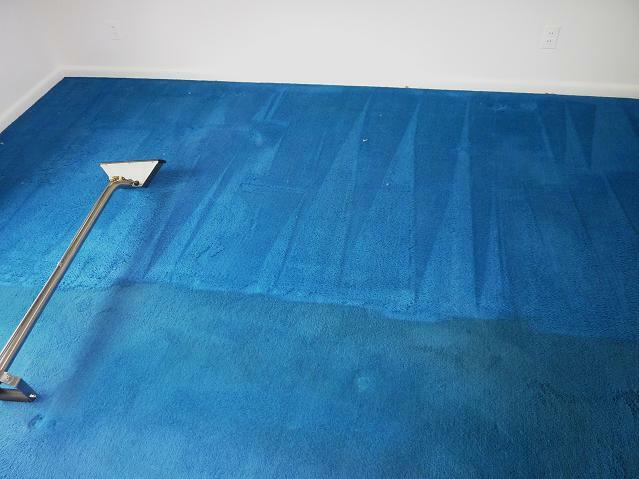 This additional step ensures that the pre-spray coats the carpet fibers from the top to the bottom. At this point the cleaner is allowed to dwell and further break down the soil preparing the carpet for the next step in the method, hot water extraction, also know as steam cleaning. This is the most effective and preferred method of carpet cleaning. Now that the carpet has been prepared and the soil has been loosen from the carpet fibers, we can begin the extraction process, where extremely hot water, 220 degrees, under pressure is injected into the carpet flushing the soil which is then immediately vacuumed by our powerful truck mounted vacuum system. The water and the soil that it is carrying is directly vacuum back to our truck where it is held until it can be properly disposed of. Your Palm Harbor, Florida home will be left with fresh, clean carpet that you and your family will be able to enjoy. Wow! Awesome job! Professional carpet cleaning is so much better than those rental machines in the grocery stores. I am now not positive where you are getting your information, but great topic. I must spend a while studying much more or working out more. Thanks for excellent info I used to be looking for this information for my mission.